Triple the sweet potato? Triple the awesome. 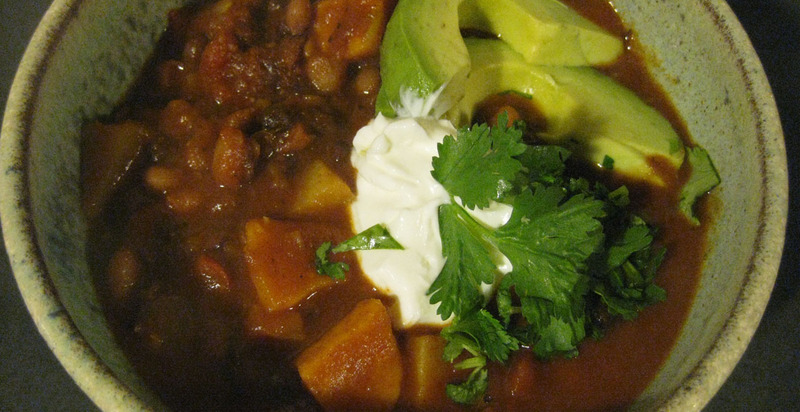 RECIPE: Black bean sweet potato (veggie) chili. You know what makes an exhausting week better? I mean, besides the alcohol? Good chili, of course. Welcome to Chili Week! Cocoa, cayenne, sweet potato and lime. What’s not to love? For years, I’ve been on the lookout for a good vegetarian chili. Not just a chili that happens to be vegetarian. But one that makes the meat eaters salivate. This is that recipe. What wooed me about it? Sweet potatoes. Ok, fine. The recipe called for ONE sweet potato. So what do I do? Buy three. They’re so pretty. Seducing me with their complementary hues. 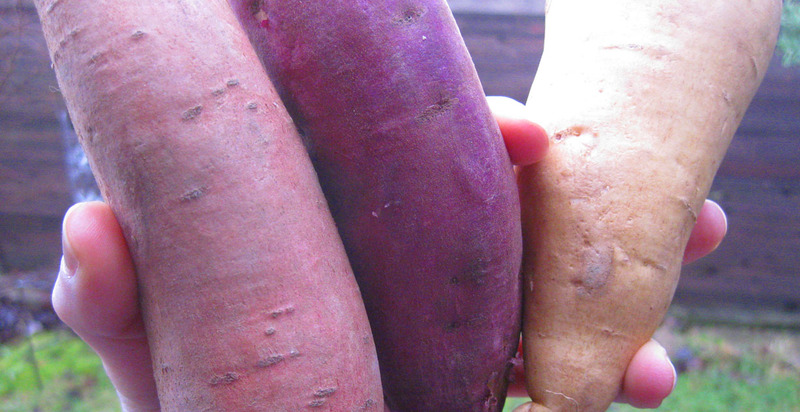 A sweet potato, yam and Asian sweet potato. The beans. It called for canned pinto and black beans, but I’m trying to avoid the cans these days. These beans, dried, were cheap and full of flavor. But the kicker? SPICE, yo. Cumin. Cayenne. Cocoa powder. Chili pepper. And cinnamon. Amen. Plus salt and pepper. I love the cinnamon and cocoa with the hot spice. It feels like the BFF of a good mole sauce. Admit it. You want some of this chili right now. After a long weekend in the office, it was fab. As it simmered, I added more spice. Then more salt and a pinch of sugar. I poured in some red wine for kicks. And topped my bowl generously with lime juice, sour cream, cilantro and avocado before I curled up on the couch with the cat. Hands down, it’s the best chili I’ve ever had. And I’m not just saying that because I nearly drank half the bottle of that red wine and was hence overly generous with my rating. This will absolutely be a standard rotation in my winter menu. Thanks Cookie and Kate for the idea! RECIPE RATING: 5 of 5 bottles of red wine. Full of rich flavor you’ll adore. 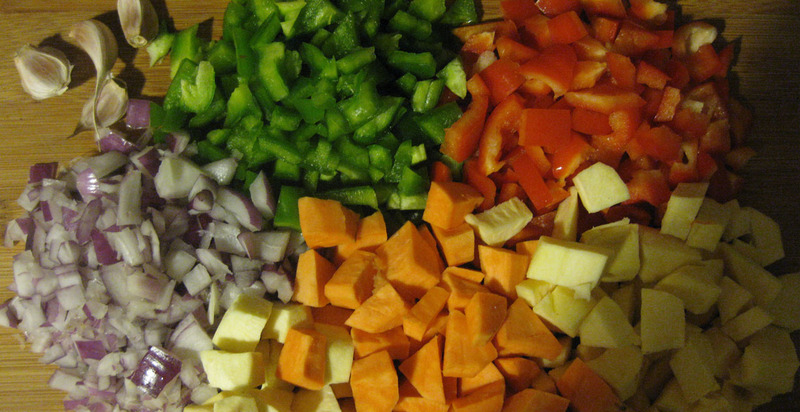 3 sweet potatoes, peeled and cut into 1⁄2-inch pieces. I used a sweet potato, yam and Asian sweet potato. 1 cup dried pinto beans; soak and prep accordingly. (Or 1 15oz can pinto beans, rinsed and drained.) I think you cold also do kidney beans if you didn’t want/have pinto. GARNISH: Sour cream, cilantro and sliced avocado. 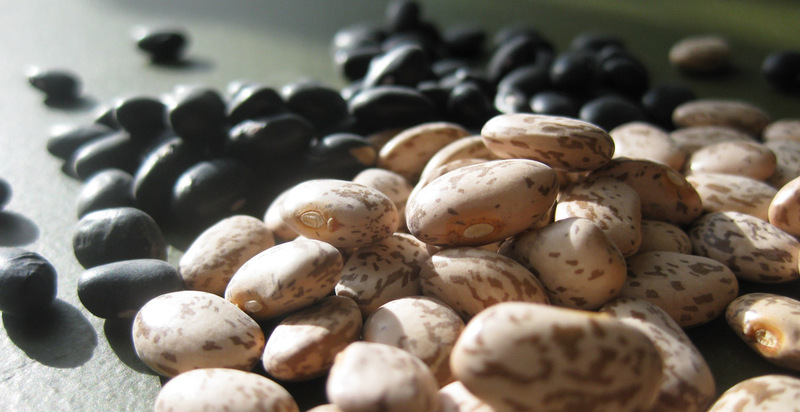 If you’re using dried beans, they need to early attention. Soak them in clean, cold water the night before, or start early the day of. I also cooked them in a separate pot (drained from soaking, cooked in new water without salt or spices) for an hour, as I prepped the rest of the chili, before adding it to my big chili pot. I know cooking beans in salt and spices can makes it harder for them to keep their shape … which is why I added them to the pot later. 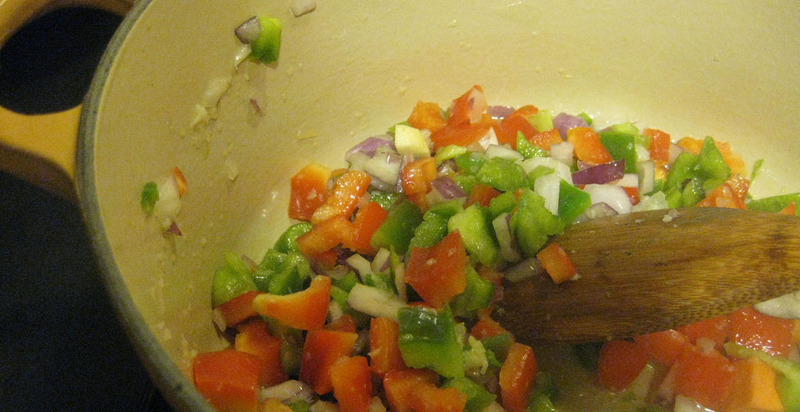 In a 4 quart Dutch oven or stockpot (I used my lovely yellow pot), saute the garlic and chopped onion and peppers in one to two tablespoon of 1-2 tablespoons of organic olive oil. When the onions begin to turn translucent, add all of the spices, potatoes, tomatoes, beans if canned, stock and stir. Reduce heat to medium/low. 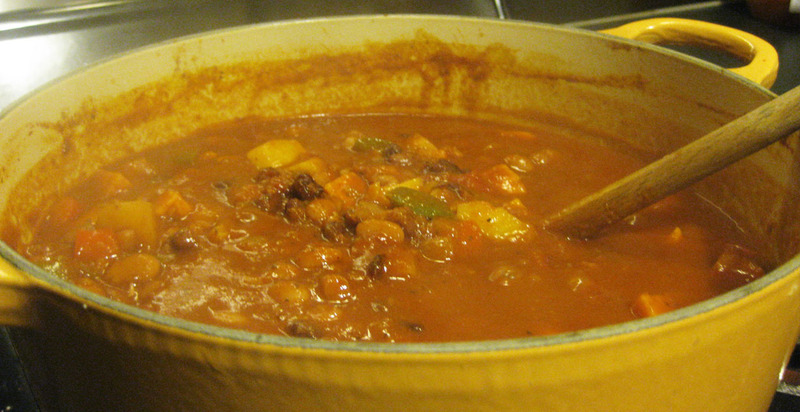 When the chili is done, the sweet potatoes should be tender and soft. 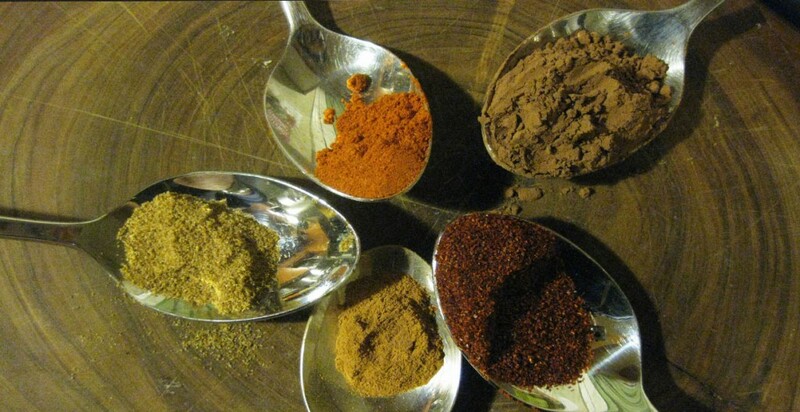 Add any more spices to taste. Serve with garnish of sour cream, cilantro and sliced avocado. 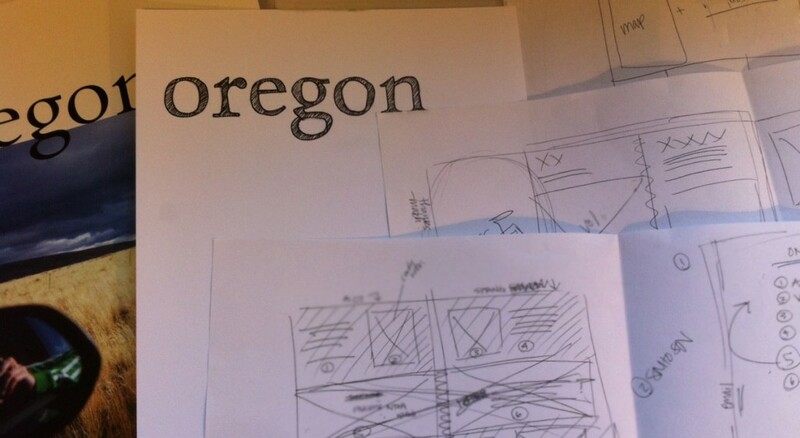 This entry was posted in 5 Wine Glasses, Dinner, Uncategorized, Vegetarian and tagged chili, sweet potato, vegetarian. Bookmark the permalink. 5 Responses to Triple the sweet potato? Triple the awesome. So glad you loved the recipe as much as I do! I’m all on board with more sweet potatoes. They’re my favorite. Since posting that recipe last year, I’ve started cooking big batches of beans and freezing them for later. It’s cheaper, healthier and so convenient! I will definitely add a squeeze of lime to my next bowl. Thanks for the idea! Making the beans in bulk is a great idea! Thanks! This chili rocks! Try it if you want something hearty and sweet, yet with an interesting kick. Especially try it if you like mole! I only smelled this chili and, no question, will be adding it to my menu choices! Hooray for mole!